Father's Day Gift Ideas | Breezy Mama Breezy Mama - Expert parenting advice, celebrity interviews, product reviews for kids, moms and babies and more! Oh boy… it’s time to either hit the stores or click on the links below for next day shipping stat because Sunday is the big daddy of holidays! If you still need presents for the dads in your life, check out Breezy Mama’s Father’s Day gift ideas for the techie, chef, outdoor lover, chef and sports fan! Keep him charged up! The world’s most powerful portable battery backup and charger – great for overnight camping getaways with the family or business trips so he can keep his digital media players, Smart Phone, iPad and gaming devices working anywhere. 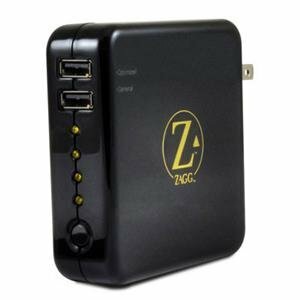 $98 — Order the Zagg Sparg 2.0 here! Can he hear it now? 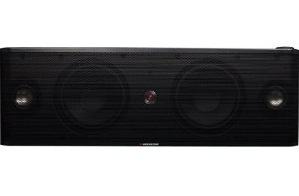 Check out this lightweight and extremely powerful speaker dock that lets dads take their favorite music wherever they go. It can play music from almost any device, streams via Bluetooth, but also has dock for iPhones and iPods. 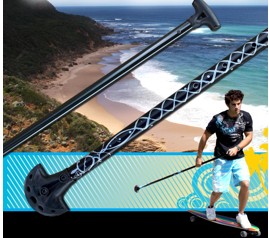 Portable, with built in handles for easy carrying – great for a day at the beach or a pick-up soccer game. $450 — Get it on Amazon for $329 — click here! Let him rock out! 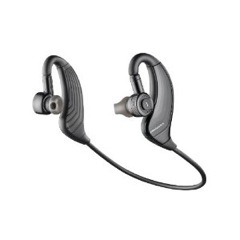 Features Altec Lansing sound technology for rich, full-spectrum stereo music and dual-mic noise-canceling technology for exceptional clarity. $99.45 — or get them on Amazon for $44.95 — click here! You ought to be in pictures! Let him capture precious moments both as photos AND as movies. 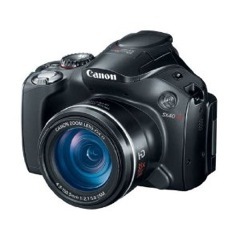 Love this camera (and have a made a few Breezy Mama videos with it!). $429 — Get it on Amazon for $350 — click here! Awww… everything he loves to read and all in one place! 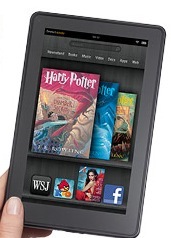 Check out the latest Kindle Fire, Wi-Fi, Full Color 7″ Multi-Touch Display. Access Over 20 million movies, TV shows, songs, magazines, and books – plus! – popular apps and games. Wake him up! 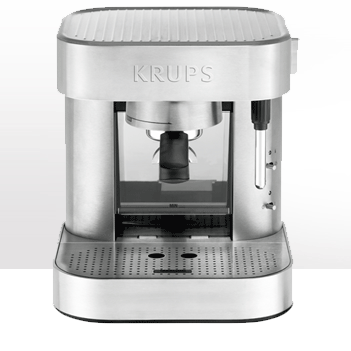 Let dad become his own barista with the KRUPS 6010 Espresso Machine. Designed in Switzerland, this 15 bar pump espresso machine boasts a full body stainless steel pump espresso. With a 50 oz. transparent, front access water tank sliding system (under the filter holder, removable) this machine has 3 exemplary functions : Espresso , Hot Water, Frother. The product also comes with a heating cup grid and the option to raise drip tray for smaller cups. $216.00 — To order, click here! Let him sleep in comfort! 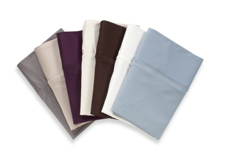 These sheets transfer body heat 2X more effectively than cotton, allowing the body to cool itself for faster, deeper sleep onset. By breathing nearly 50% better, they reduce sleep-disrupting temperature fluctuations at night. Oh, and they’re cooler to the touch compared to cotton bedding. $159.00-219.00 — To purchase, click here. Surf without water! Check out this longboard made for the streets! Combined wit the Big Stick (see below), he can get a workout AND have some fun! 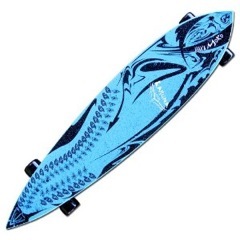 Part two is the “Kahuna Big Stick” – an accessory to the classic longboard. Rather than pushing with your feet (like a traditional skateboard or longboard), you merely pull yourself forward with strokes of the Big Stick, which also helps maintain balance. With the Big Stick, the longboard can be ridden on pavement in a similar fashion to how a stand-up paddleboard is ridden in the ocean! $99 — To purchase, click here! The Excalibur 3500 5-Tray Food Dehydrator is the most popular choice for active fathers who love the outdoors and want the convenience of countertop use. 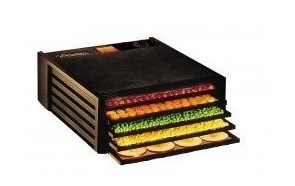 This dehydrator contains 5 large polycarbonate trays with 8 square feet of tray area. The unit boasts a built in on/off switch, a convenient removable door, a timer and an adjustable thermostat, allowing temperatures from 85º to 145º F. With 35 years of manufacturing excellence, the Excalibur Food Dehydrator sets the industry standard for design, quality, and dependability. $250 — To order from Amazon for $199, click here! Bring the feast wherever he goes! 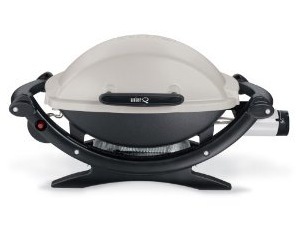 This BBQ rules and my husband loves to take his along for meals on the go. Great for camping, parks and beaches! Be sure to check out the stand below, too! $159 — To purchase from Amazon for $149, click here! Be sure to get the accompanying stand that folds up with ease, and you can set the BBQ on while cooking and roll around from there! $54.99 — To purchase from Amazon for $49.99, click here! For the man who likes it hot (sorry, couldn’t resist)! Check out these spicy sauces to spruce up his BBQ or for delicious dips. 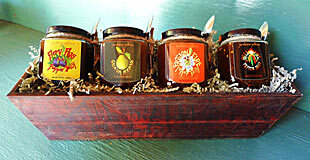 In this particular wooden box comes: Hell Fire Pepper Jelly, Fiery Figs Pepper Jelly, Guava Brava and Passion Fire Pepper Jelly. I don’t know about you, but my mouth is already on fire – YUM! $48 — To purchase, click here! 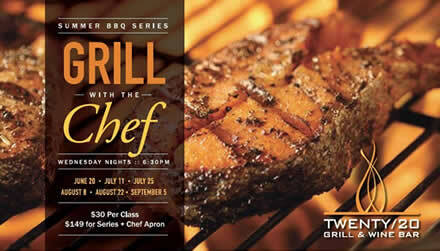 Make Your Dad a grilling legend in his own backyard for Father’s Day by giving him, the “Grill with the Masters” Summer Barbeque class series offered by Twenty/20 Grill & Wine Bar at the Sheraton Carlsbad Resort & Spa. For more information, call 760.827.2444 or visit Sheraton Carlsbad. Take him out to the ball game! Always wanted to treat him to season passes but couldn’t afford it? Check out a mini-plan, similar to the one in San Diego where you purchase four home games for a lower cost. Prices vary depending on seats, but to learn more, click here! Looking to get him to laugh? Check out the hilarious products from Zazzle. My personal favorite? 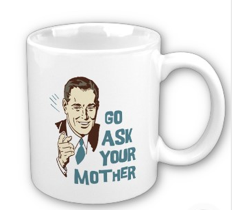 This mug that says, “Go Ask Your Mother.” I must admit — I have definitely been guilty of saying the opposite! There’s also cards, “King of the castle” ties, customized tee shirts (think: his face on a shirt!) and more. Keep up to date! Get Breezy Mama by email. PLUS! Be alerted to new posts, give aways and more! OH! And be automatically entered to win your own BOB Stroller Strides Fitness Stroller!